Take a dash of John Hiatt, sprinkle in some Del Shannon, add a few pinches of traditional bluegrass, and you've got "Gone", an upbeat eclectic mix of bluegrassified rock, folk, bluegrass, and original tunes. What happens when you bring together a bass-playing attorney, guitar-strumming bilingual reading specialist, fire-on-the-fiddle volcanologist, and a banjo-picking elementary school principal? Correct if you circled "c)", Fadin’ by 9. Recently called "masters of fusing bluegrass with rock and folk sounds..." by The Columbian, Fadin' by 9 creates its unique brand of bluegrass by blending traditional bluegrass tunes with "bluegrassified" versions of rock and folk tunes, along with their own "quirky" original songs that mostly defy categorization. Each band member takes a turn at lead vocal, bringing different vocal flavors to each tune. 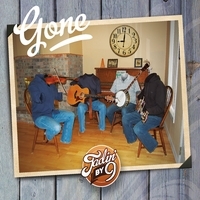 With a heavy emphasis on hot pickin' and three- (and sometimes four-) part harmony singing, Fadin' by 9 creates a unique upbeat sound that will have your feet tapping all night long.